The Autopsy Posts: What Was the Actual Murder Window for the Death of Hae Min Lee? This portion of the closing argument was the source for one of the more memorable moments of the Serial Podcast: In Episode 5, Sarah Koenig and Dana Chivvis try to retrace Hae Min Lee's movements on the afternoon of January 13, 1999 to determine whether she could have been killed between 2:15 and 2:36* (really 2:35), as claimed by the prosecution. If defense counsel had acted properly, however, this murder window should have been much, much smaller. That sounds logical enough, given that school ended at 2:15 P.M. In Episode 5, however, Adnan tells Sarah Koenig that students had to wait for the bus loop to clear before they could drive in front of the school and eventually leave school. According to Adnan, this "took about ten to fifteen minutes." When Sarah and Dana retrace Lee's steps, this estimate is corroborated, with the bus loop clearing "eleven minutes, thirty eight seconds" after school ends at 2:15 P.M., i.e., at 38 seconds after 2:26. This creates its own timing issue. If Lee was in "real high black heels," how long would it have taken her to exit her car, go to the concession stand, get her snack, talk with Inez, and get back to her car? Four minutes? If so, we're at 2:30. Three minutes? If so, we're at 2:29. Less? More? If defense counsel properly cross-examined Inez, it's likely that the start of the murder window would have been pushed back to somewhere around 2:29 or 2:30,** not 2:15. Let's now turn to the end of the murder window. This is what led me to write this post. In Episode 5, Sarah and Dana conclude that it was possible but far fetched for Adnan to kill Lee in time to call Jay at 2:36 from Best Buy. This conclusion, however, is not based on their actual experiment. In their dry run, they are able to make the call "twenty-two minutes and two seconds" after the school bell rings at 2:15. In other words, their call is 2 seconds after 2:37. Presumably, Sarah and Dana were speculating that the drive could have gone a little bit more quickly on January 13, 1999. Of course, Sarah and Dana give themselves "a minute and a half in the car for the actual killing part." As you can see, Dr. Korell testified that it takes ten seconds or so for the strangulation to knock the victim unconscious, followed by "death a couple of minutes later." The prosecutor later tried to get Dr. Korell to say that 10-15 second of strangulation can lead to death, but Dr. Korell's response was simply that 10 seconds produces "unconsciousness," with that unconsciousness turning into death after some unspecified time. This is the only logical response because no expert is going to tell you that strangulation will cause death in 10-15 seconds. Q. How were you able to tell that it wasn't from strangulation? A. Okay. The reason you can tell is really easy. When you talk to the witnesses, they all said that he only had his arm around the neck for like 20 seconds or something like that and then he was fighting, fighting and then he stopped and that's how you die, is strangulation. It's an -- it's -- it takes a while, okay. And this guy was just struggling and then he just kind of died right there in front of him. There were two witnesses, you know, one was I think the manager of the bar. The other one was just a plain old person there. And we know the time sequence, because there was telephone calls and the medical examiner got up and said, well, she thought he had only been strangled 15 seconds and you could die from that, and the literature says no. The literature -- there's a series of experiments done in the early 1940s where what they did was they put cuffs around the neck. You know, like a blood pressure cuff? A. And then they expanded it instantly and then they left it on for about the certain amount of time, and based on that, they found out how long a person could get this type of constriction and lose consciousness. And then in their additional experiments, they left the cuffs on up to a hundred seconds. That's what, one minute and 40 seconds? And then, of course, the person was obviously unconscious and they took the cuff off and the guy regained -- guys regained consciousness in 20 or 30 seconds and walked out of the room in about a minute or two. So they know that constrictions of the blood vessels in the neck up to a hundred seconds is harmless. Q. Okay. What about beyond that? A. Well -- well, okay. Now beyond that, it's -- you can't do that experiment. A. But based upon the reaction up to a hundred seconds, it's generally assumed that with strangulation, not hanging, that if you maintained it for more than two to three minutes, you're getting to the point where you so deplete the oxygen in the brain that the person will cease respiration. It doesn't mean they can't be revived, but they no longer will breathe unless you start CPR. But that's the thing: It does take 2-3 minutes to fatally strangle someone, meaning that Lee had to be in the Best Buy Parking lot by 2:32 or 2:33 for the strangulation to start in time for Adnan to call Jay at 2:36. Assuming that defense counsel objected to Murphy's argument that strangulation can result in death in 10-15 seconds as opposed to the "couple of minutes" stated by Dr. Korell, 2:32 or 2:33 would have been the end (or at least the start of the end) of the murder window. So, that was the actual window the jury should have been considering at trial: Lee getting in her Sentra at 2:29 or 2:30 after visiting the concession stand, and Adnan starting the fatal act of strangulation in the Best Buy parking lot at 2:32 or 2:33. Inconceivable? *Keep in mind that Jay never says in any interview or testimony that Adnan called him from Best Buy at 2:36 or even close to 2:36. Instead, he consistently states that Adnan called him at or after 3:40. At the second trial, Jay places the call after 3:45 (page 130). **Possibly the more important part of Inez's police statement was that she recalled seeing Lee keeping her Sentra running, with the keys in the car, when she went to the concession stand. Presumably, this means that Lee was driving and that Adnan was not in the car. Given that the prosecution claimed that Lee was in the passenger's seat when she was killed, you would have to add in additional time for Lee to later pick up Adnan and switch seats. ***100 seconds is slightly under 2 minutes, but it is hard to believe that Adnan would have strangled Lee for the very bare minimum amount of time. After all, the prosecution claimed that Adnan's EMT training made him acutely aware of how to strangle someone. Surely, he wouldn't have risked only strangling Lee for the very bare minimum amount of time. ****Keep in mind that Jay said he saw Adnan standing at the external Best Buy pay phone***** when he arrived at the store. This certainly implies to me that Adnan was still standing there after making the call. But wouldn't that mean that Adnan would have needed to spend time putting Lee in the trunk before calling Jay, making a 2:36 call even less likely? *****An external pay phone that apparently didn't even exist. Also take into account the fact that the prosecution states that Hae's body was moved from the car to the trunk while still in the parking lot. Plus, no murderer would want to leave a dead body sitting in the front of their car while they walked away to make phone calls. This would definitely add a few extra minutes...to look around and make sure the coast is clear, pick up the body, carry it to the trunk, and then situate it in the trunk. 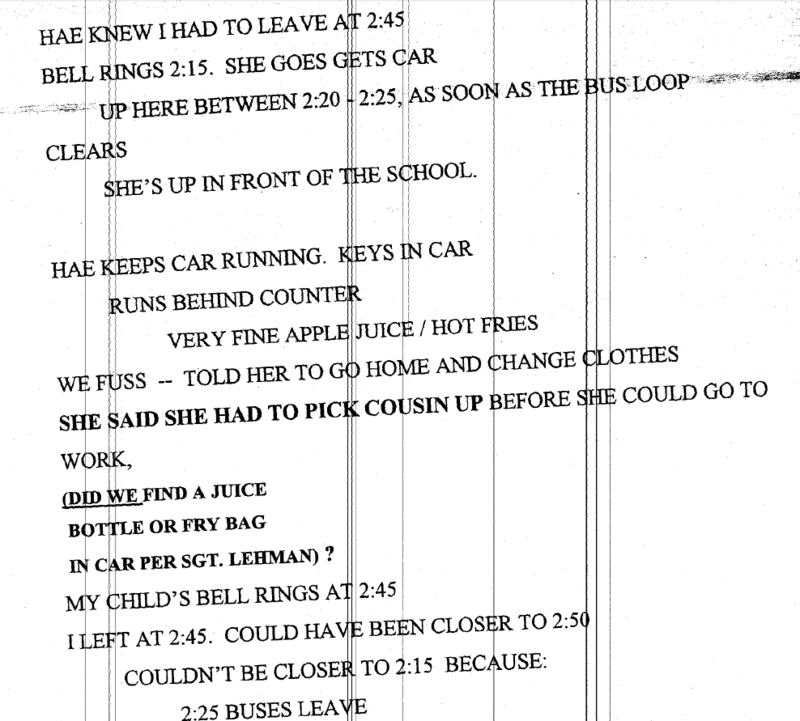 Did the statement Inez gave the police eliminate the possibility that Adnan was driving Hae's car, which was why Hae left it running while she ran to get her snack? Of course, there still wouldn't have been enough time for Adnan to drive to BB, strangle Hae, stuff her body in the trunck and then go call Jay at the nonexistent outside pay phone. Aren't opening and closing statements viewed different than testimony. Aren't they just each sides proposal of what they think happened? Alexa: Yes, it seems implausible that Adnan left Hae in the passenger compartment when he called Hae, and it also seems implausible that he moved her to the trunk while in the Best Buy parking lot. Tessa: Inez's statement certainly implies to me that she saw Hae get out of the driver's side of the Sentra with the car still running. Also, if she saw Adnan in the Sentra, you think she would have mentioned it. Chester: 1. Yes, opening and closing are different. They're not evidence, but they must be based upon facts in evidence. As such, defense counsel should have objected to the claim that the 2:36 call was the Best Buy call and the claim that Dr. Korell said strangulation can lead to death in 10-15 seconds. 2. It seems pretty clear that there was a payphone INSIDE the Best Buy. On one hand, this corroborates Jay because a call could have been made. On the other, the location of the phone is entirely inconsistent with Jay's claim that he came upon Adnan standing outside at the payphone. Having a hard time posting because post keeps refreshing and comment disappearing. The 2:15 time with Inez is impossible If HML had to get her car from the back lot in the presence of traffic and buses, park in the circle and run to the kiosk. 2:20 - this time is also unlikely, although women can run in high heels. But, if HML parked in the front lot, in the one of 10 spaces as she was known to do at times, 2:20 is plausible to be speaking with Inez. However, Summer, the former Woodlawn student who contacted SK during the podcast said that she was speaking with HML near the gym as late as 2:40 pm. This conversation was memorable to her as she was nervous about helping HML score the wresting match and there was some doubt about HML even attending. Summer was never interviewed by the police. How did the prosecution get the timelime so wrong. More disturbing, it seems the jury completely failed to grasp this impossible timeline. Badger: Yes, if you believe Summer from the podcast, none of this is really relevant in terms of what actually happened. It just relates to what happened and what should have happened at trial. Inez's statement is a bit confusing because she says she saw Hae "between 2:20 and 2:25, as soon as the bus loop clears." Later, she says that the buses leave at "2:25." So, wouldn't that mean she saw Hae between 2:25 (2:26) and 2:30? If what Adnan said and the dry run showed were correct, that timing would have been more accurate. Of course, these are just notes written down by someone else, so it's possible something was a bit lost in translation. Going back to the autopsy info, will you be addressing the 1 1/4" x 1/4" mark on Hae's neck at all? I've seen discussion about whether or not this may suggest ligature strangulation. Do you know anything about this? Is the prosecution's claim of manual strangulation sound? Anon: I was told that was consistent with manual strangulation by a person wearing gloves. Normally, you would see fingerprints, but the gloves "would change the presentation of the injury some." I'm assuming that it could also be consistent with ligature strangulation. Pardon my tardiness, catching up on the posts from the last week. First, as others have had issue, the BB call always bothered me because it's referred to as the "Come Get Me" call. This is a bit of a misnomer. It's more of a "Come Follow Me as I Drive Around" call. So, in broad daylight in an open parking lot Adnan violently struggles with and strangles her, then immediately gets out of the car and makes a phone call at the highly-visible entrance, then moves the body to the trunk, then waits for Jay, then pops the trunk, then drives the car with Jay following and without any idea where to go. Who wouldn't be desperate to get away from the scene as quickly as possible? I know it's impossible to find the rationale of a killer by supposing what you would do, but this is next-level bonkers. Rant over. As far as evidence goes, a few questions. Did the clothes Inez described Hae as wearing that day match the clothes on her when she was found? Did they find a juice bottle and fry bag in the car? Were the stomach contents included in the autopsy?